Extremely high frequency (EHF) is the International Telecommunications Union (ITU) designation for the band of radio frequencies in the electromagnetic spectrum from 30 to 300 gigahertz. It lies between the super high frequency band, and the far infrared band which is also referred to as the terahertz gap. Radio waves in this band have wavelengths from ten to one millimetre, giving it the name millimetre band or millimetre wave, sometimes abbreviated MMW or mmW. Millimetre-length electromagnetic waves were first investigated in the 1890s by Indian scientist Jagadish Chandra Bose. Compared to lower bands, radio waves in this band have high atmospheric attenuation; they are absorbed by the gases in the atmosphere. Therefore, they have a short range and can only be used for terrestrial communication over about a kilometer. In particular, signals in the 57–64 GHz region are subject to a resonance of the O2 molecule and are severely attenuated. Even over relatively short distances, rain fade is a serious problem, caused when absorption by rain reduces signal strength. In climates other than deserts, absorption due to humidity also affects propagation. While this absorption limits potential communications range, it also allows for smaller frequency reuse distances than lower frequencies. The short wavelength allows modest size antennas to have a small beam width, further increasing frequency reuse potential. Atmospheric attenuation in dB/km as a function of frequency over the EHF band. 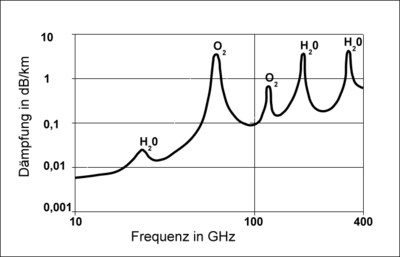 Peaks in absorption at specific frequencies are a problem, due to atmosphere constituents such as water vapour (H2O) and molecular oxygen (O2). Millimeter waves travel solely by line-of-sight, and are blocked by building walls and attenuated by foliage. The high free space loss and atmospheric absorption limits propagation to a few kilometers. Thus they are useful for densely packed communications networks such as personal area networks that improve spectrum utilization through frequency reuse. They show "optical" propagation characteristics and can be reflected and focused by small metal surfaces around 1 ft. (30 cm) diameter, and diffracted by building edges. At millimeter wavelengths, surfaces appear rougher so diffuse reflection increases. Multipath propagation, particularly reflection from indoor walls and surfaces, causes serious fading. Doppler shift of frequency can be significant even at pedestrian speeds. In portable devices, shadowing due to the human body is a problem. Since they penetrate clothing and their small wavelength allows them to reflect from small metal objects they are used in millimeter wave scanners for airport security scanning. Satellite-based remote sensing near 60 GHz can determine temperature in the upper atmosphere by measuring radiation emitted from oxygen molecules that is a function of temperature and pressure. The ITU non-exclusive passive frequency allocation at 57-59.3 GHz is used for atmospheric monitoring in meteorological and climate sensing applications, and is important for these purposes due to the properties of oxygen absorption and emission in Earth's atmosphere. Currently operational U.S. satellite sensors such as the Advanced Microwave Sounding Unit (AMSU) on one NASA satellite (Aqua) and four NOAA (15-18) satellites and the special sensor microwave/imager (SSMI/S) on Department of Defense satellite F-16 make use of this frequency range. In the United States, the band 38.6 – 40.0 GHz is used for licensed high-speed microwave data links, and the 60 GHz band can be used for unlicensed short range (1.7 km) data links with data throughputs up to 2.5 Gbit/s. It is used commonly in flat terrain. Uses of the millimeter wave bands include point-to-point communications, intersatellite links, and point-to-multipoint communications. There are tentative plans to use millimeter waves in future 5G mobile phones. Recent studies at the University of Leuven have proven that millimeter waves can also be used as a non-nuclear thickness gauge in various industries. Millimeter waves provide a clean and contact free way of detecting variations in thickness. Practical applications for the technology focus on plastics extrusion, paper manufacturing, glass production and mineral wool production. Most widely used in former USSR nations, low intensity (usually 10 mW/cm2 or less) electromagnetic radiation of extremely high frequency (especially in the range 40 – 70 GHz, which corresponds to wavelength of 7.5 – 4.3 mm) is used in human medicine for the treatment of many types of diseases. This type of therapy is called millimeter wave (MMW) therapy or extremely high frequency (EHF) therapy. More than 10 000 devices are used for millimeter wave therapy worldwide and more than a million people have been treated with millimeter wave therapy during its documented history. Established in 1992, the Russian Journal Millimeter waves in biology and medicine is dedicated to the scientific basis and clinical applications of millimeter wave therapy. More than 50 issues of it have been published. 1 2 3 4 5 Huang, Kao-Cheng; Zhaocheng Wang (2011). Millimeter Wave Communication Systems. John Wiley & Sons. pp. Sections 1.1.1–1.2. ISBN 1-118-10275-4. ↑ Rappaport, T.S. ; Sun, Shu; Mayzus, R.; Zhao, Hang; Azar, Y.; Wang, K.; Wong, G.N. ; Schulz, J.K.; Samimi, M. (2013-01-01). "Millimeter Wave Mobile Communications for 5G Cellular: It Will Work!". IEEE Access. 1: 335–349. doi:10.1109/ACCESS.2013.2260813. ISSN 2169-3536. ↑ "Slideshow: Say Hello to the Goodbye Weapon". Wired. 5 December 2006. Retrieved 16 August 2016. ↑ Newscientisttech.com Archived March 11, 2007, at the Wayback Machine. 1 2 Frank, Thomas (18 February 2009). "Body scanners replace metal detectors in tryout at Tulsa airport.". USA Today. Retrieved 2 May 2010. ↑ "Mirror for Star Ledger Article "PATH riders to face anti-terror screening -- Program will begin at station in Jersey City". 2006-07-12. p. 014. ↑ "Statement of Robert Kane to House of Representatives" (PDF). 2011-11-03. p. 2.